Good Morning and Happy Monday!!! 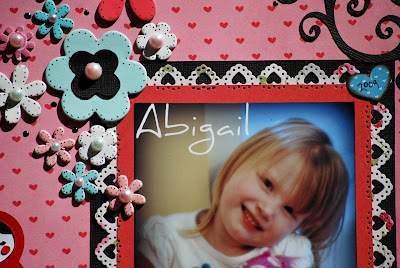 I got this lo done last night it is a pic of my three yo granddaughter Abigail. The title came from her, she is always coming up to me out the blue and saying Love ya grandma....well it just melts my heart!!!! That sweet voice....awwww!! I love it!! Well let me tell ya doing girl los is way out of my league!!! Yes I know I have girls, but they are 16, 19, and 20. The six boys I do most of my los on, I don't even buy pink papers, but I do adore boy prints!! lol!! I may have to change!! The pp was also donated to us from Imaginisce at the Rusty Pickle retreat. I thank them!! The papers are awesome. The Babushka Dolls oh my...as soon as I saw the Paisley cart. I was sold!! I just had to use them and since Abigail is such a doll how perfect!!! Love how they turned out!! Once again thanks Cricut!! Had so much fun making them!!! The Dolls Cricut cut at 2 1/2 from Paisley Cart. Just wanted to thank you for the comment you left me on my blog. How sweet of you. I have always admired your los and think your creativity is stellar. I have always wondered where you find the time between all of your kids and the various design team requirements. I absolutely love your newest lo. Love, love, love the bright colors. I did buy Paisley, but have yet to use it. Have missed seeing your work lately and was happy to see that you had posted a new lo. I sincerely hope that things pick up for your family. I know that times are tough right now for a lot of us. I was a SAHM for 20 years until my marriage ended. It was hard re-entering the work force and unfortunately I lost my first two jobs to the economy. I was very fortunate to start a new job this July. It is in the biotech industry, which is way out of my league. I have learned a lot since I started, but have so much more to learn. It is a very high paced, stressful job. I try when I have the free time to work on my los. I just do't always have the time. Keep you chin up, and take life a day at a time. That is what I do. Things will turn around in time. This is lovely Dawn....such a beautiful GD...can't wait til I have some...but it will be a while...I love the colors and cuts and the flowers are amazing not to mention your beautiful design! You already know how much I love this but thought I'd tell ya again! This is gorgeous! I love the colors the paper the details, the pic and everything, just so sweet! Wow Dawn...another fantastic creation...love the new cart...might have to get me that one....Thanks for the inspiration. You have such a way with making things pop! The colors are beautiful and your granddaughter is a real cutie! I don't know how you get so much done. I'm such a slacker and I don't have half the load you do! Inspiring you are! Happy Wednesday! Oh,this is just beautiful! Everything about this layout POPS out at me! Your GD is beautiful!